Din Casita, i Pine Country! Ligger 3 kvartaler fra Courthouse Square, Whiskey Row nattsputer, gallerier, underholdning, unik shopping og mange restauranter i lett gangavstand. Ligger på Granite Creek, og en blokk fra sti for Granite Creek Trail. Åpen planløsning frittliggende Casita. Queen size seng og sovesofa betyr at vi kan romme opptil 4 gjester. 12 'x 12' pergola for å nyte morgenkaffen eller teen i det vakre været i Prescott. BBQ Grill tilgjengelig for din bruk også. ** Hjemmekonstruksjonsprosjektet startet nettopp 2 mange sør for oss. For dag / sen sleepers kan dette være et problem. Very cute place! Really enjoyed the snacks they left. Lots of little touches like a beautifully set table, nice patio for relaxing, and small heater in bathroom for cold mornings. Owners are very nice and helpful. Nice binder with recommendations for places to eat and things to do. We enjoyed our stay and the owners were well communicative towards us!! Sande and her group were very respectful of our property and policy requests. We would gladly host them again. We enjoyed our stay very much. 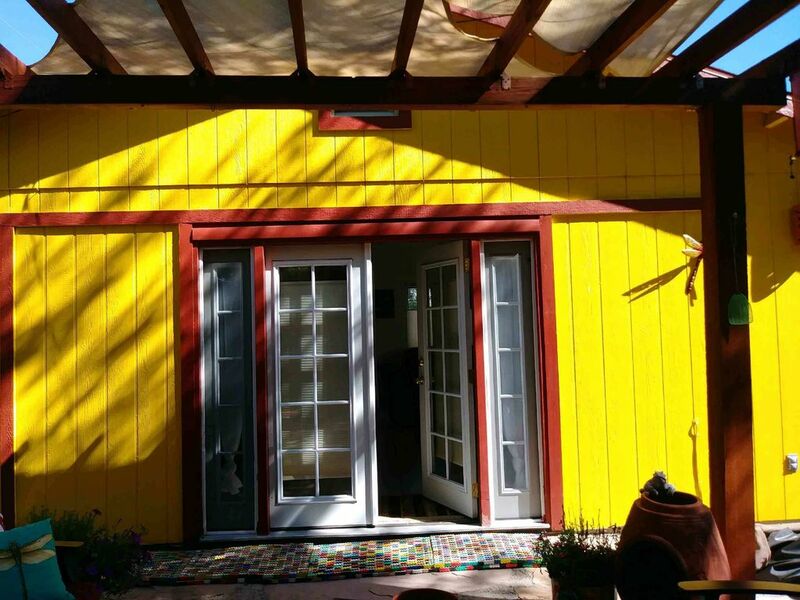 The Casita is clean, comfortable, and equipped with everything we needed and more. We loved the colorful décor, the original art displayed, the dinnerware, all very colorful and tastefully displayed. Even the yard was colorful and very nice. We appreciated the privacy of the fence. We also especially enjoyed the many books about local history. The information we found in those books really enhanced our exploration of the area. Our hosts were extremely responsive yet not at all intrusive. In fact, we never met Coco. They're available when you have a question, but otherwise we never saw or heard them. From this little Casita, we were able to take day trips in every direction and explored the area every day. We found the town of Prescott to be very friendly, with plenty to see and do. Should we ever come this way again, we'd love to return to this cozy home. Susan and Dennis are delightful guests. They were very respectful of our property and house guidelines. We had a brief interaction with them and found them to be warm, charming. and gracious. We would have enjoyed sharing a meal with them. Susan and Dennis are welcome here any time. Wonderful. Very clean and hospitable. We loved our visit! Coco and Steve went out of their way to make sure our stay was perfect. Thanks for the hospitality, cleanliness and wonderful snacks! We have traveled all over with VRBO and they were top notch! Highly recommend them! Very charming. I very much enjoyed my stay. Convenient to downtown. Thank you so much. You really have a nice place.